So in my ever going quest to bring you more breakfast posts this year (that was my blog resolution) I have a treat for you guys today! Who hasn’t loved banana splits growing up? I mean they are an iconic treat that I’m sure everyone has tried at least once or has at least heard of. I mean the flavor combo on those things are absolutely wicked and pretty much are the kitchen sink in one! 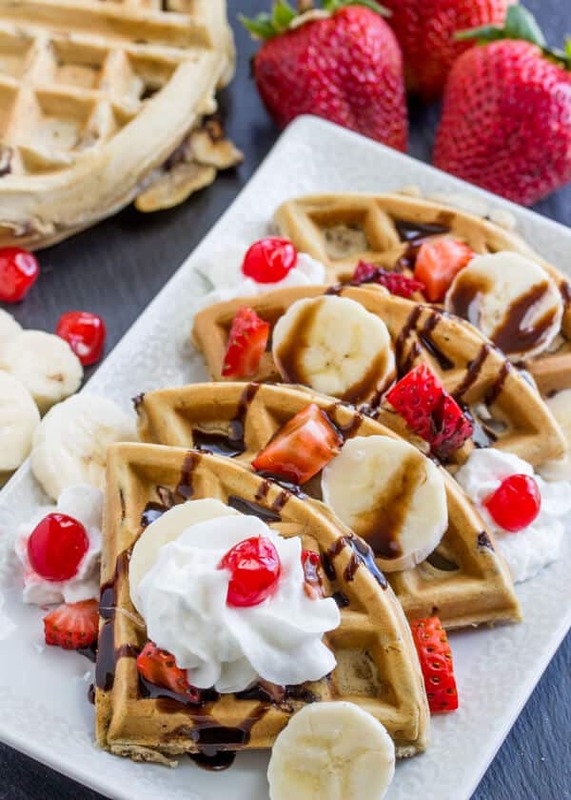 Well you guys…I made some seriously addicting Banana Split Waffles to share with you. Yeah…waffles. Don’t you just love how I’ve been turning desserts into breakfast lately? I mean if you haven’t seen some of my creations you can check out my Black Forrest Waffles or maybe my Strawberries and Cream Overnight Oats! I love my dessert so if I can turn some of my favorite flavors into breakfast than more power to me! So these puppies are super fun and super easy! My kids absolutely love the toppings. They are kinda sick and tired of the old plain waffles with maple syrup kinda deal. I mean I would be too, I like a little flavor to my meals. I mean don’t get me wrong, waffles and syrup are good by themselves but what about switching it up from time to time and giving a little spin on the old dated breakfast? 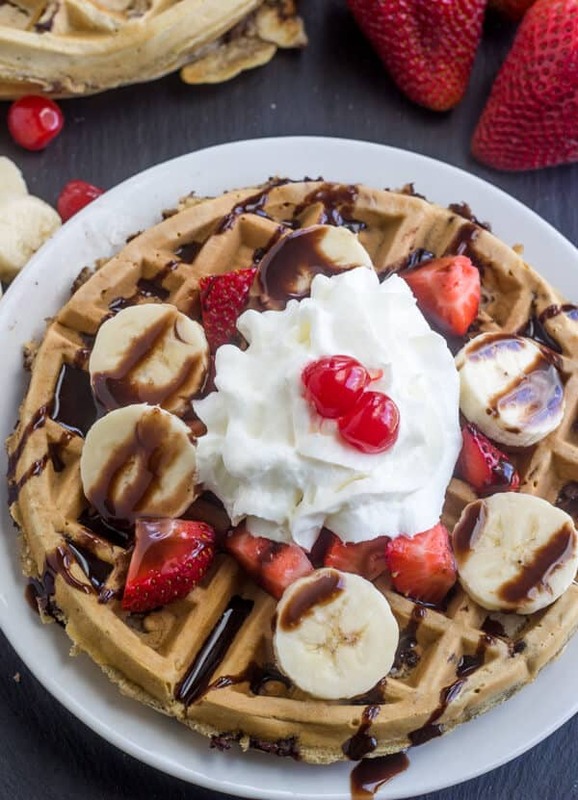 So these Banana Split Waffles are a light fluffy waffle stuffed with mini chocolate chips. Then they are topped with strawberries, bananas, chocolate syrup, whipped cream and to top it all off a cherry on top! I know that some people like pineapple on their banana splits but that’s just not for me. Although if you’d like to add some pineapple to the top of your waffle go for it! I’m sure it would be an amazing addition hands down! I was so mad I had went and bought all the ingredients to make these Banana Split Waffles and I forgot my cherries. I know, I know it’s just for show but seriously, it’s literally the cherry on top of this whole thing. Now I would have loved to go for a steamed cherry, my little general store in the town of 800 people I live in had regular maraschino cherries, which I was just lucky they had in the first place so I’m counting my blessings on that! If you don’t have a waffle maker, go out and buy one now! They are seriously amazing. Like I never thought that I would ever use or need one because I mean….frozen waffles man. But listen when I say that homemade waffles are 100% better. Plus that waffle maker can be used for tons of other waffling of things! If you don’t know what I’m talking about, just search Pinterest and you’ll find an overwhelming amount of things that you can make in a waffle maker. So case in point…if you’re looking for a fun twist on a childhood favorite treat. 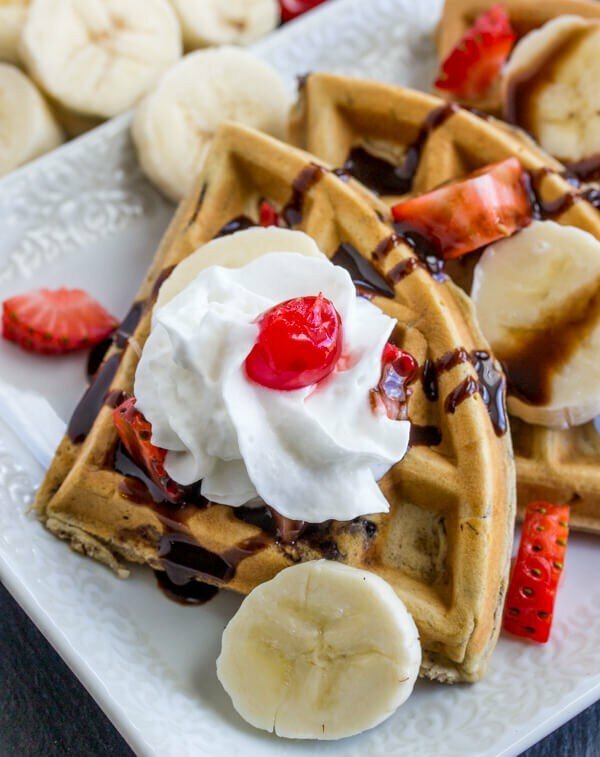 Something your kids will love to help with and devour then these Banana Split Waffles are right up your alley! Plus you can freeze any leftovers which is nice for a quick breakfast at a later date! In bowl whisk together your flour, sugar, baking powder, baking soda, salt, cinnamon, set aside. In another bowl stir together your bananas, milk oil and vanilla until combined. Stir your wet mixture into your dry and then stir in your eggs and fold in chocolate chips. Cook in your waffle maker according to the brand directions. Top with strawberries, bananas, chocolate syrup, whipped cream and cherries. 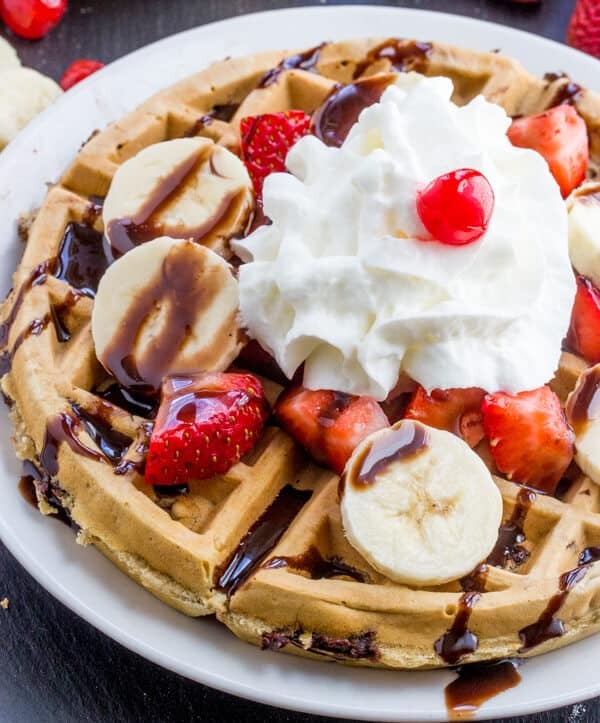 These waffles are calling out my name! Thanks Ashley! My kids adored them. 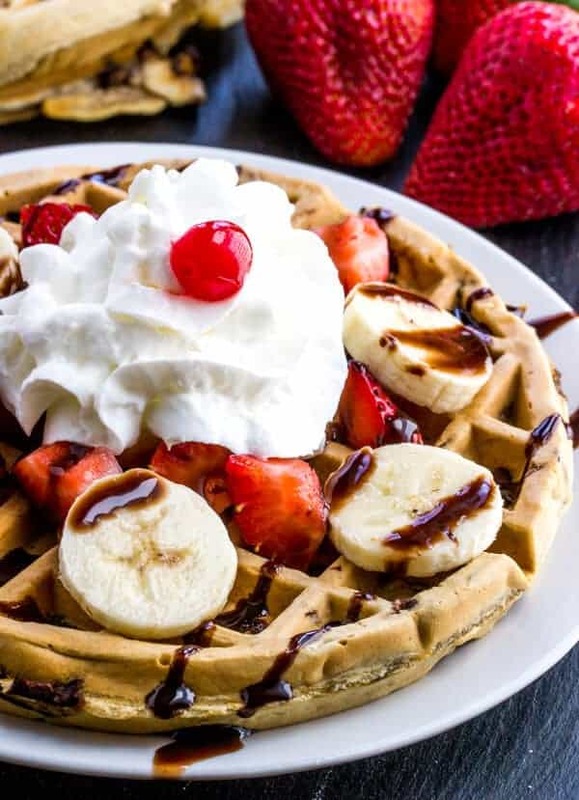 We love waffles and I always look for new flavors and ways to serve waffles! Your recipe will make my family really happy! 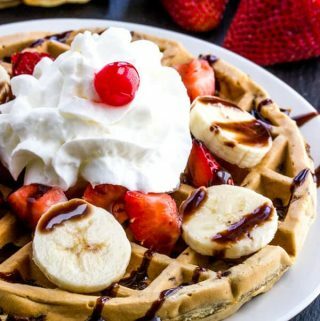 What a fun spin on waffles! These are just so much fun! My kids would love these! This is creative! Beautiful photos too.